Find out how to play Jade Magician, the new online pokies game from Play’n Go that’s full of mystique, mystery and bonus potential, at the best real money casinos on the Web. 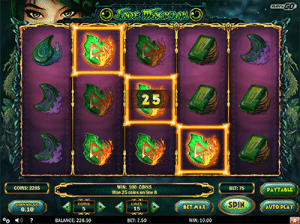 Jade Magician is a standard five-reel, three-row online pokies game from leading software developer, Play’n Go. Along with 15 customisable paylines, this slot offers such features as wild symbols with multipliers, scatters, a second chance bonus and free spins. It features a tranquil oriental inspired soundtrack, and is themed around the idea of magic being found in all elements – earth, air, fire and water. As the name suggests, Jade Magician is seeped in the colour green, resulting in a soothing and slightly exotic gaming experience. The RTP (return to player) is 96.53%, which isn’t that high compared with many other online pokies, but is still an improvement over the RTP found in land based casinos in Australia. Jade Magician is available for instant-play, which means you can play directly over your Web browser (Chrome, Safari, Firefox, Explorer, etc) without worrying about downloading any software. It has also been optimised for mobile, so you have the choice of playing on the go using any data-enabled smartphone or tablet. Simply head to a reputable online casino offering Play’n Go pokies, like any of the top-rated casinos recommended on our site and sign up for an account to play for real money. Make a deposit using a trusted payment method, then load Jade Magician and set the size of your bet. You can choose to play up to five coins with a coin size of 0.01 to 0.25, and as little as one or as many as 15 paylines per spin. Jade Magician requires a minimum bet of $0.01, with maximum bets capped at $18.75. Not sure if Jade Monkey is the right game for you? Our recommended casinos provide the option of playing for free in practice mode, so you can try it out before deciding to bet any of your own money. Wild symbol – The games jade wild symbol can only appear on the third reel. It substitutes all other symbols to form a winning combination, except for the scatter symbol, with all wins containing a wild symbol awarding 2X the normal prize. Scatter symbol – The scatter is the exotic Jade Magician herself, which has the power to award the Second Chance bonus and Free Spins. 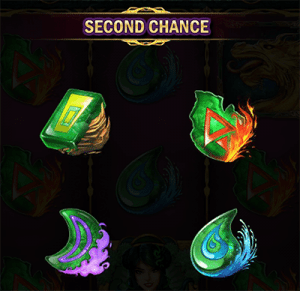 Second Chance Bonus – If only two of the Jade Magician scatter symbols appear after a spin, the Second Chance Bonus is triggered, allowing you to choose between four symbols for your chance to either enter the free spins round or get an instant cash prize. 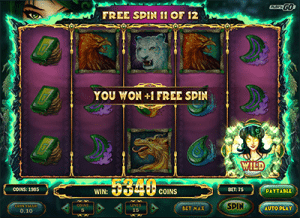 Free Spins – Free spins are activated upon landing three or more of the Jade Magician scatter symbols on reels one, three and five, with up to 50 free spins up for grabs. During your free spins bonus, you’ll receive an additional one or two free spins for every Jade Magician scatter symbols that appears. During our testing of Jade Magician we were initially quite underwhelmed. The graphics and game design, while serene and decent enough, don’t look quite as advanced as we’d expect from a 2017 game release. After a few trial spins, the low RTP seemed evident, as it felt like a lifetime before we’d won a single cent from this game. But then came the Second Chance bonus and the instant this feature was triggered, Jade Magician showed us what it was made of. We picked our way into the free spins round, where it felt like the wins would never stop, racking up coins and Big Wins like they were going out of style. 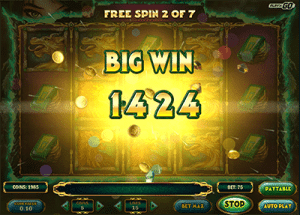 The additional free spins awarded for every scatter symbol that appeared extended the life of the Free Spins bonus dramatically and we walked away with a hefty sum and feeling pretty happy about Jade Magician. Therefore, our verdict is that if you manage to trigger the bonus features, Jade Magician will leave you quite satisfied, but without luck on your side it’s quite flat, volatile and will get boring pretty quickly.